Our ESCAPE-Pain courses are here to help you manage your daily symptoms of chronic knee or hip pain. 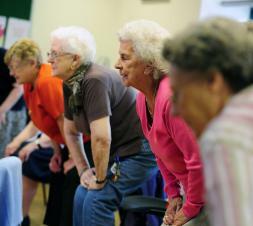 This unique Education & Exercise class is aimed at people with Osteoarthritis. ESCAPE-pain is a 6 week, 12 session rehabilitation programme for people with chronic hip and knee joint pain. It is a well recognised national programme, run by highly professional ESCAPE-Pain trained instructors. We are holding group courses taking place twice a week in places across North Yorkshire. To find the next course in your area, please check the course listing below or call North Yorkshire Sport on 01423 226303 during office hours for more information. Escape Pain courses will be starting in April 2019 in the Scarborough and Ryedale districts. Course details will be posted here as soon as they are available. Ask your GP or Physiotherapist about referral to the programme or patients can self-refer by e-mailing info@northyorkshiresport.co.uk or telephone 01423 226303 during office hours.